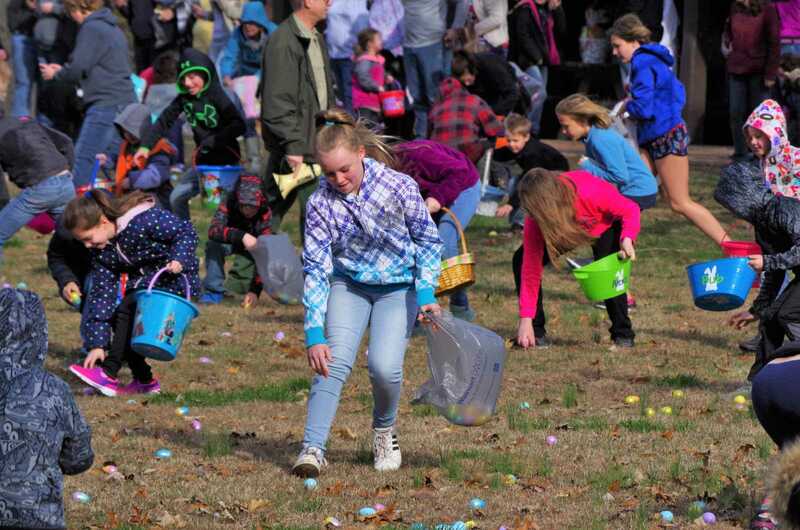 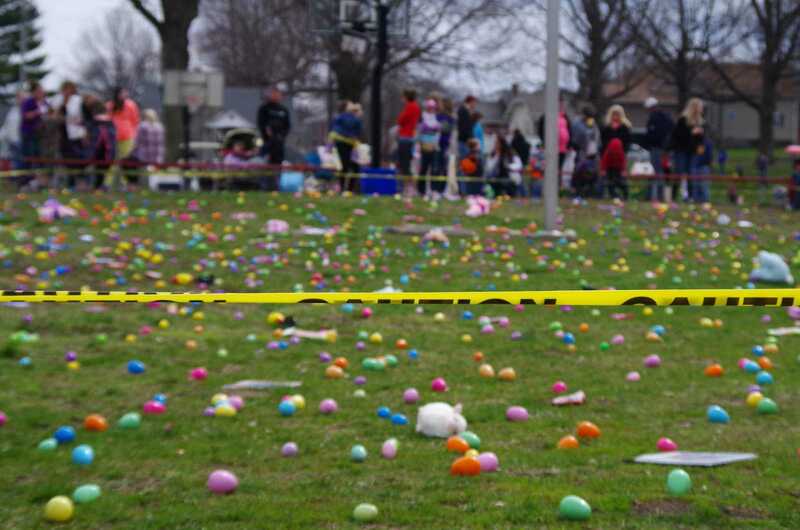 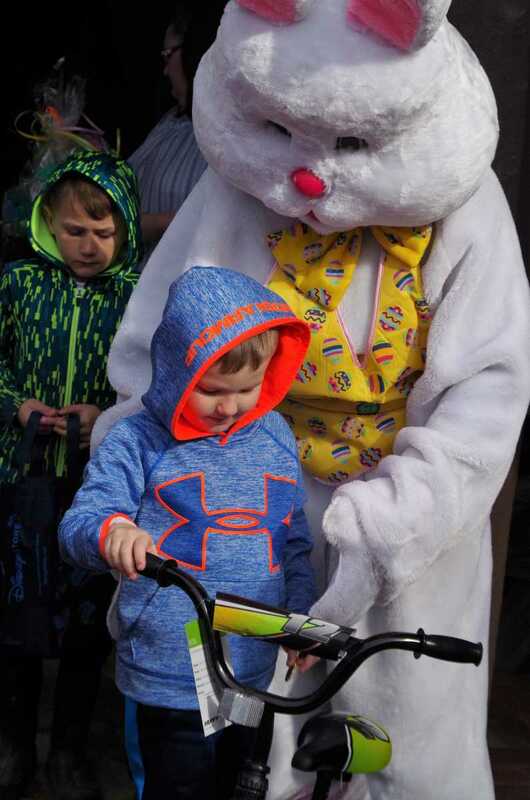 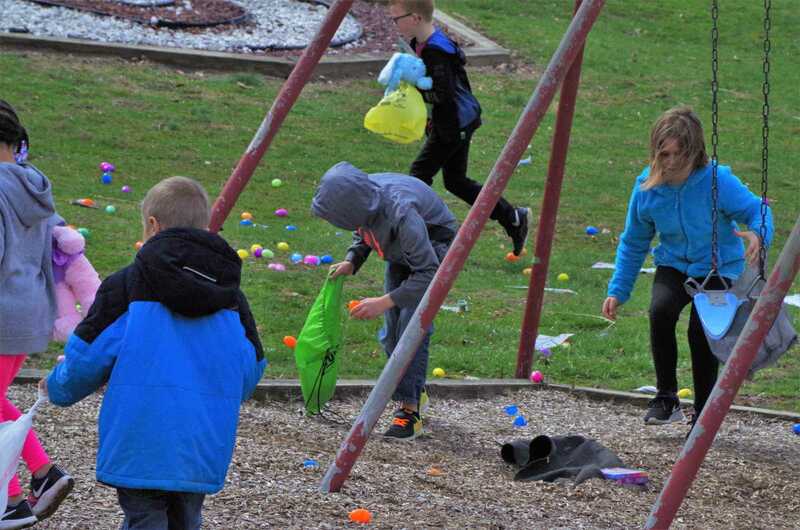 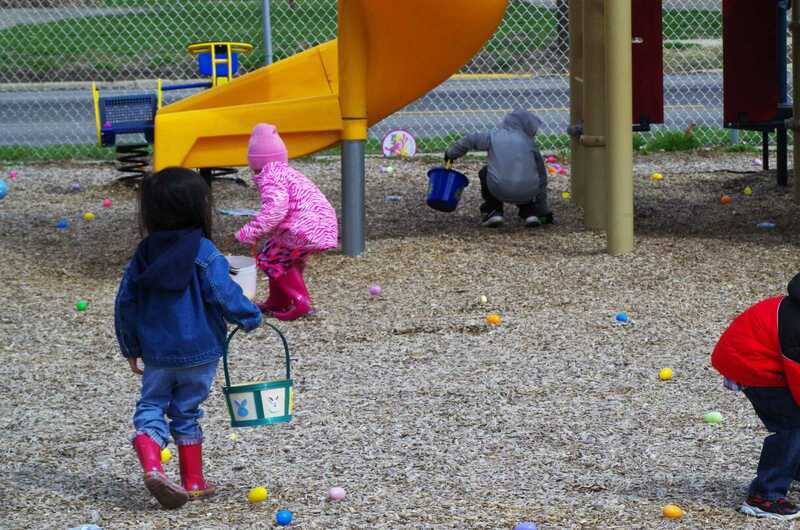 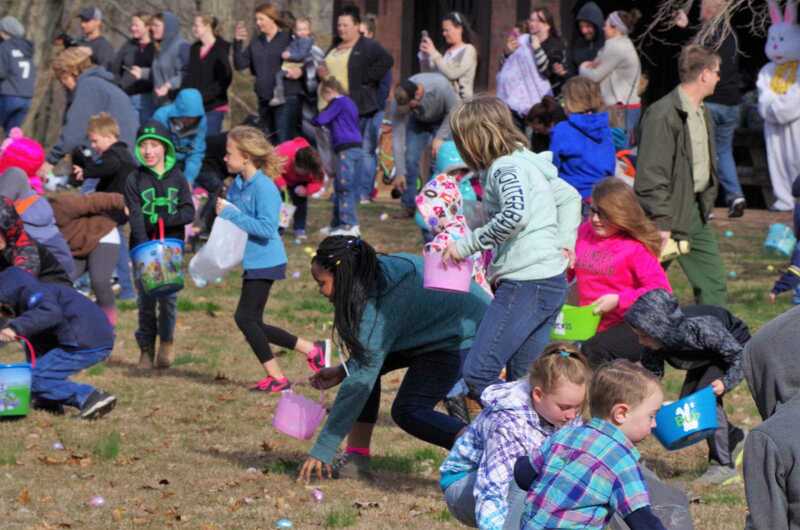 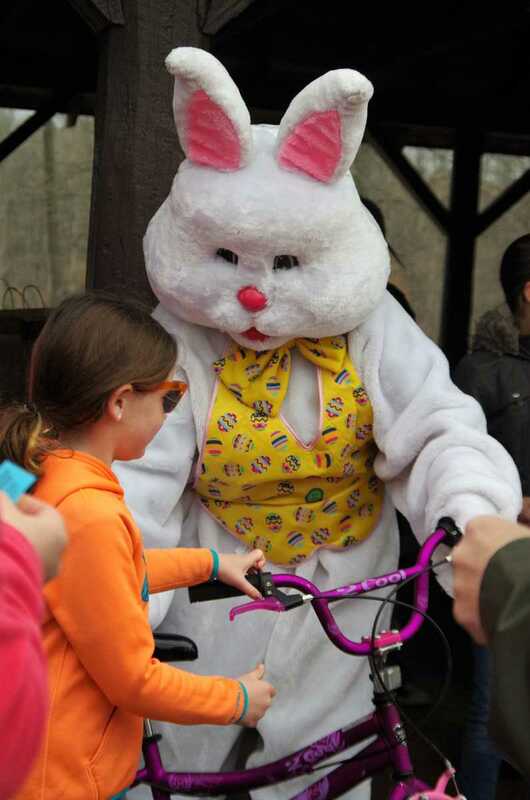 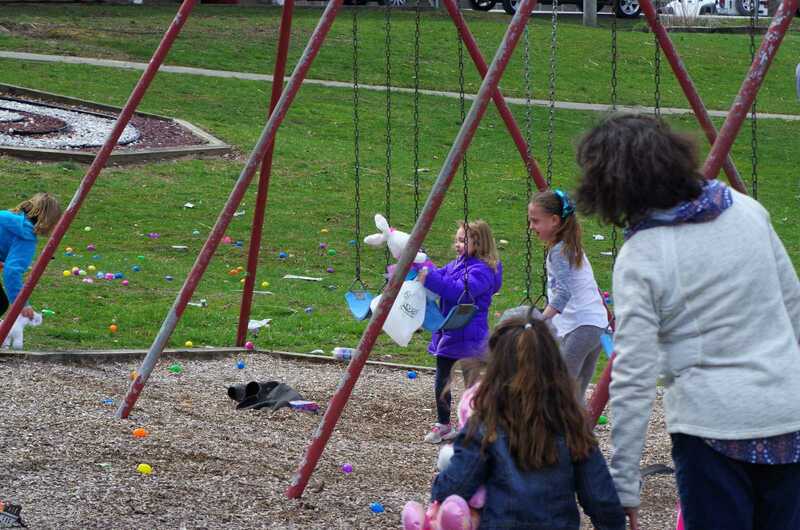 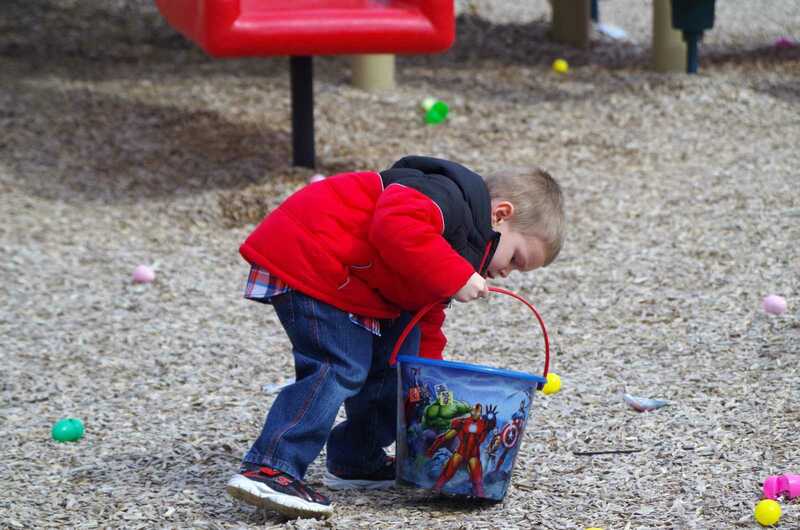 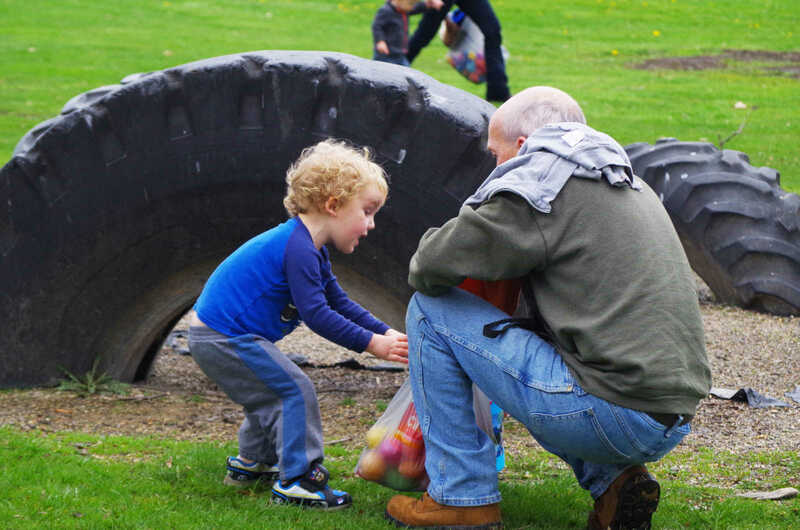 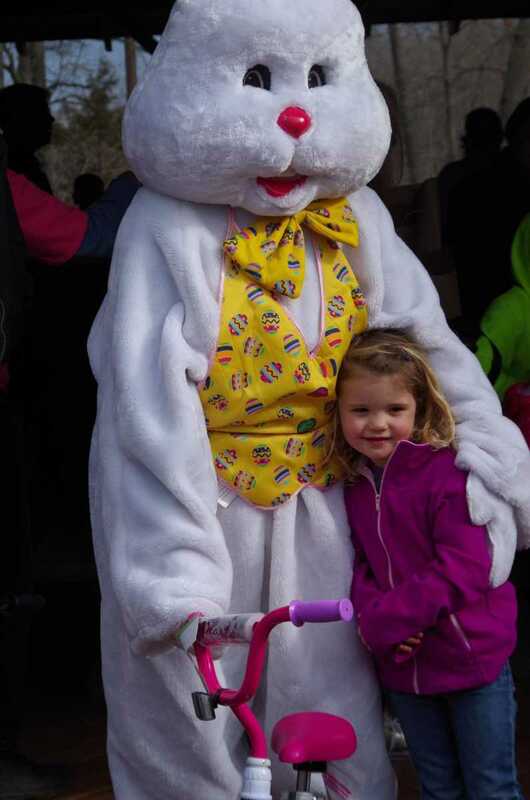 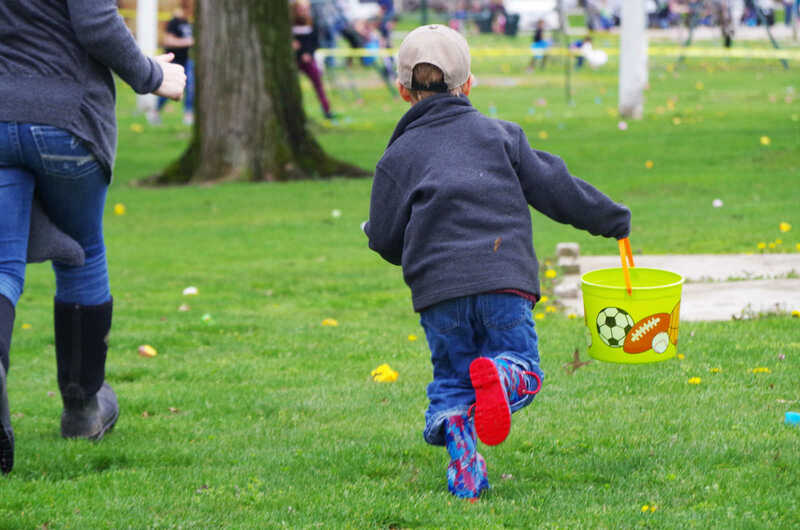 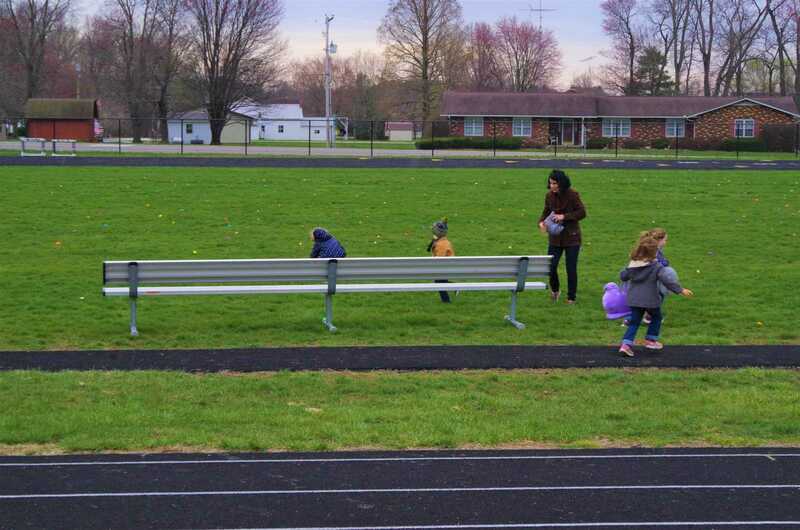 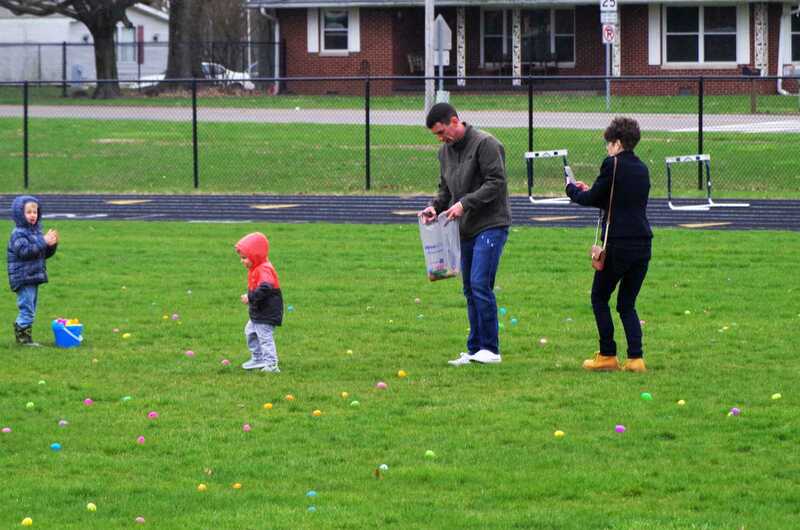 Although most Easter Egg Hunts scheduled for last weekend were rescheduled to March 31 on account of inclement weather, it took a little more than 40 mile-per-hour wind gusts to keep the kids away. 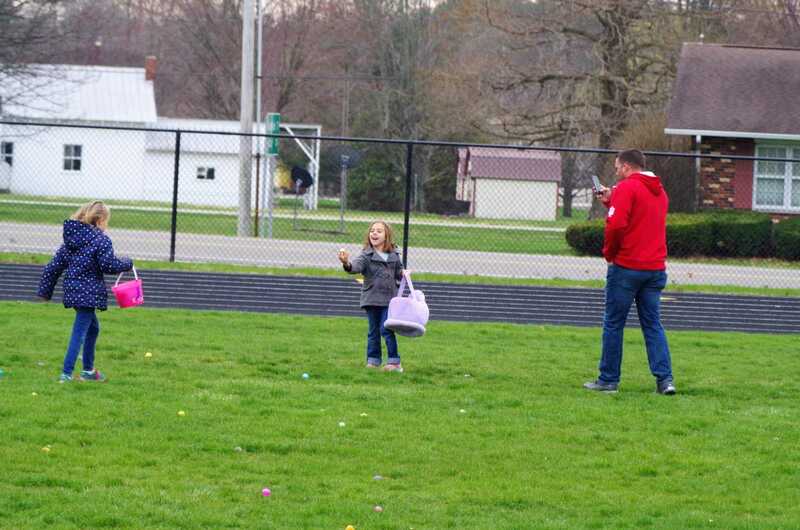 If anything, it may have helped to propel them toward their colorful targets. 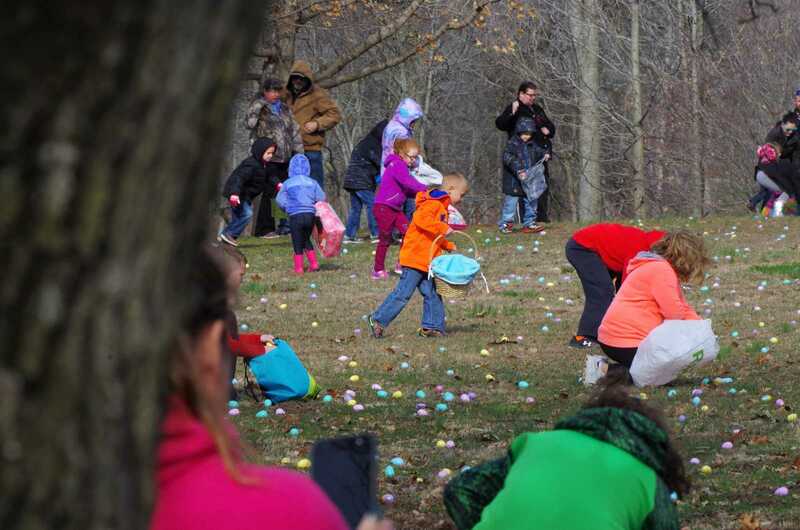 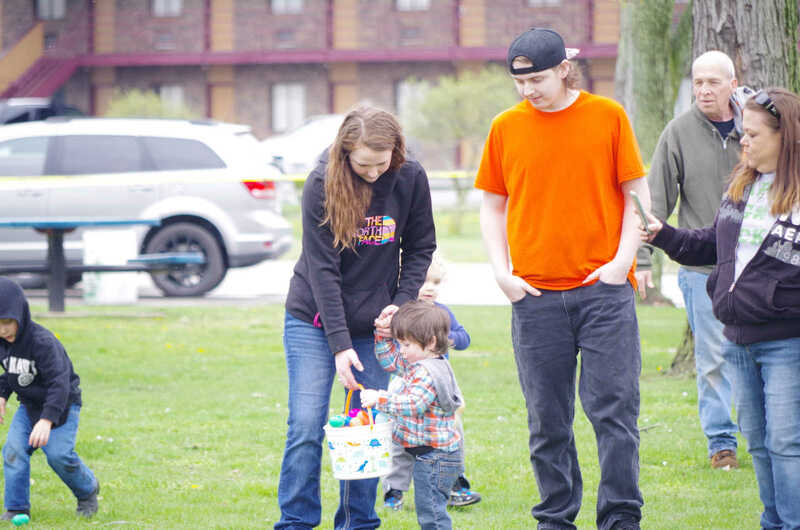 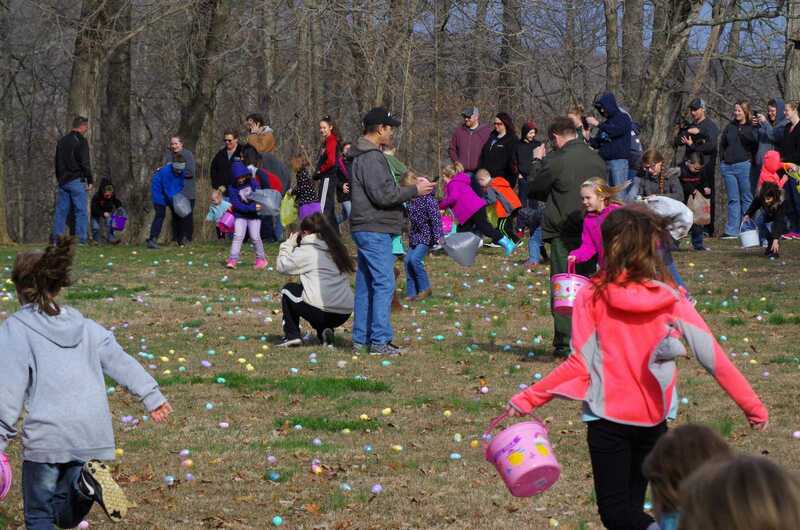 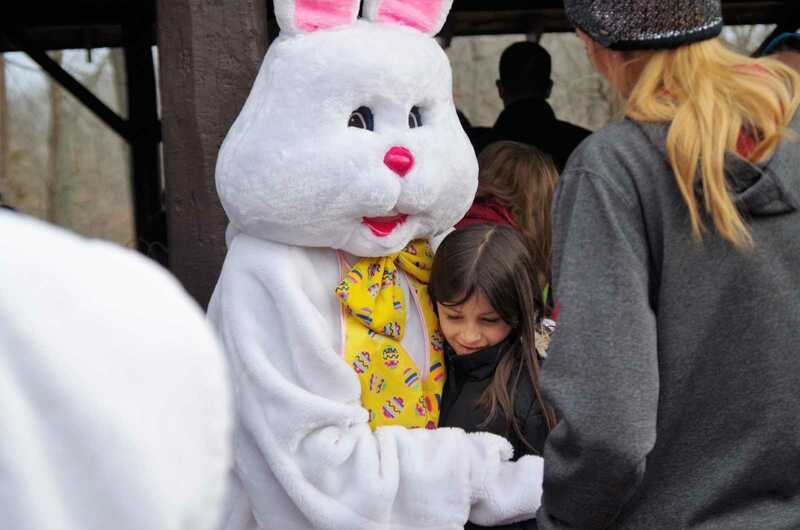 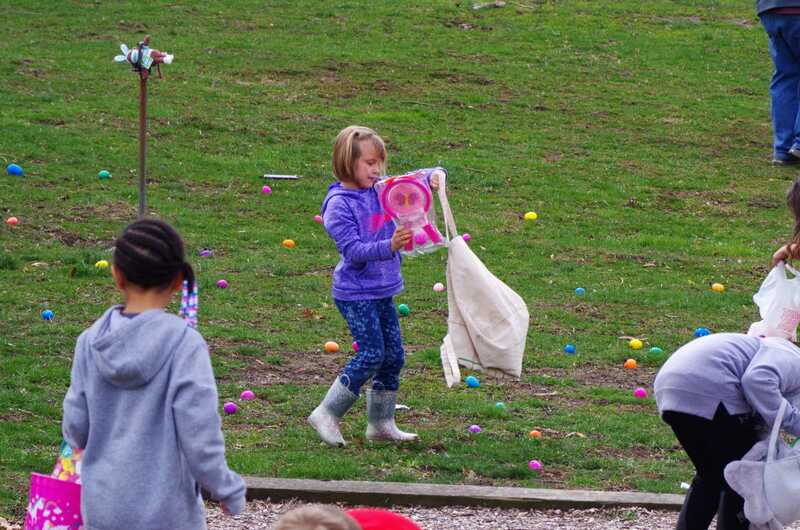 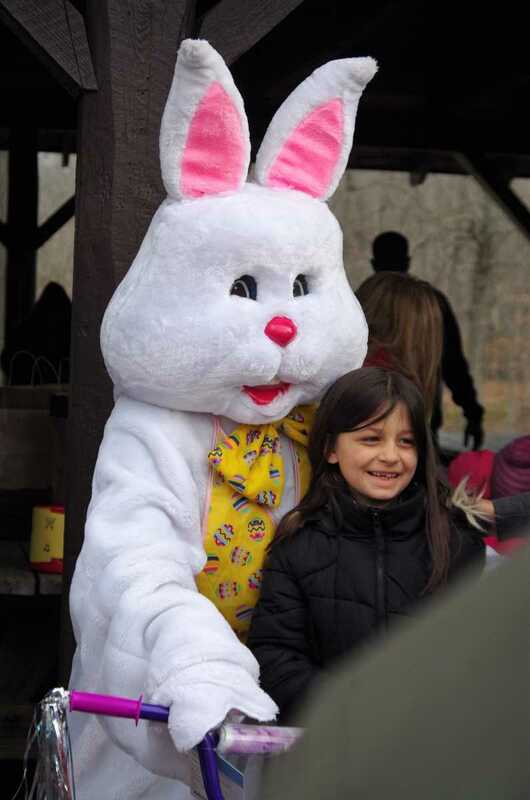 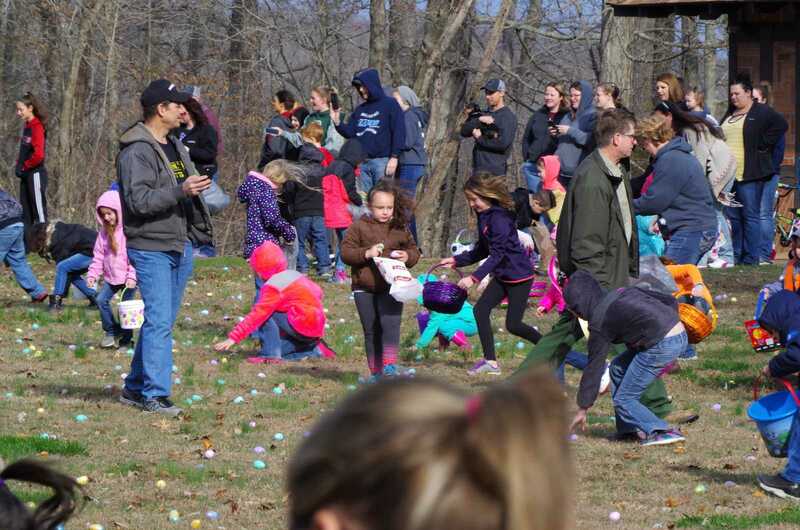 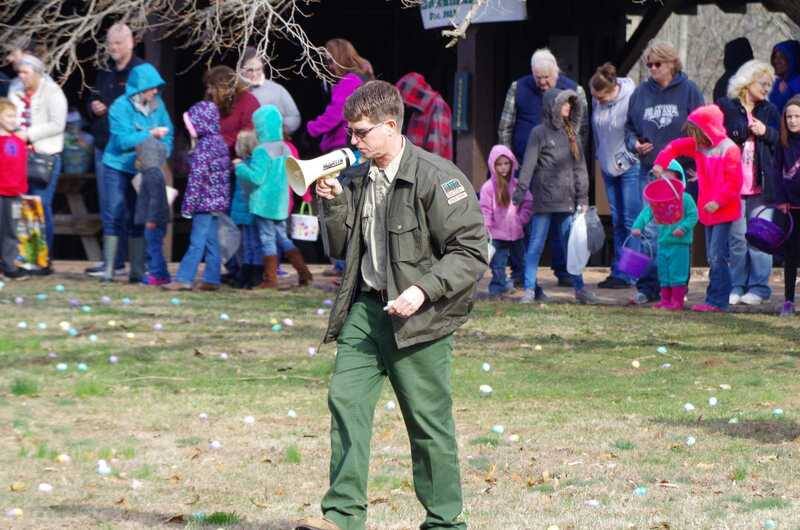 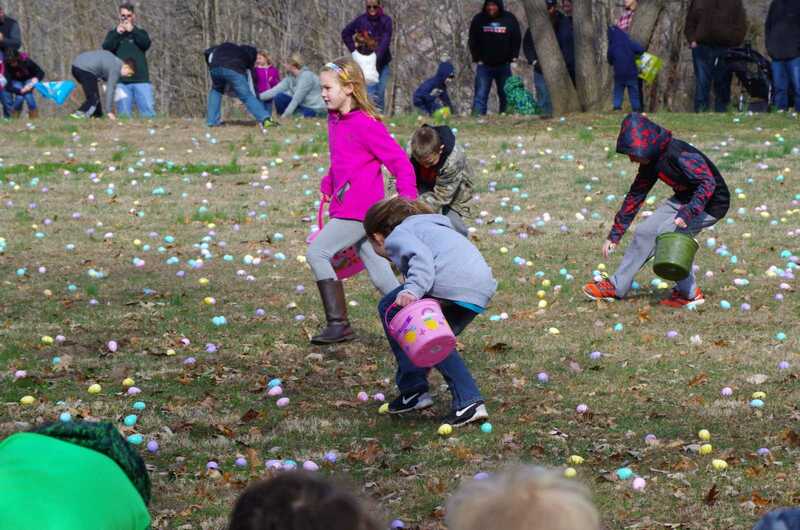 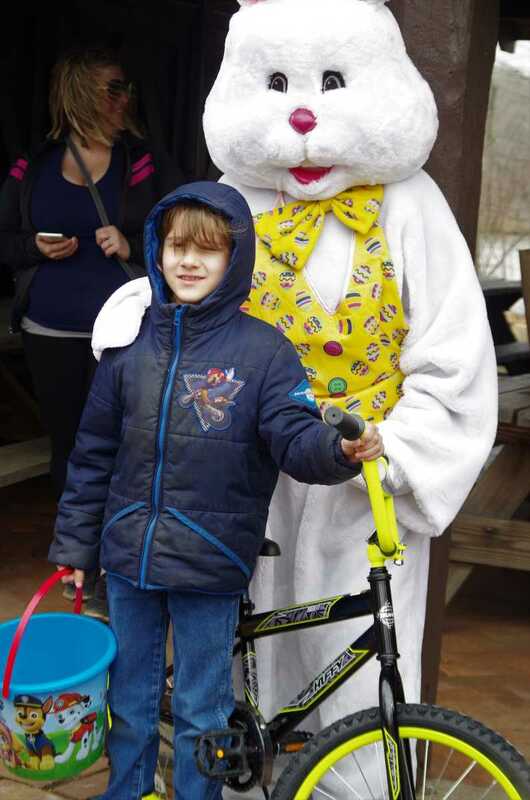 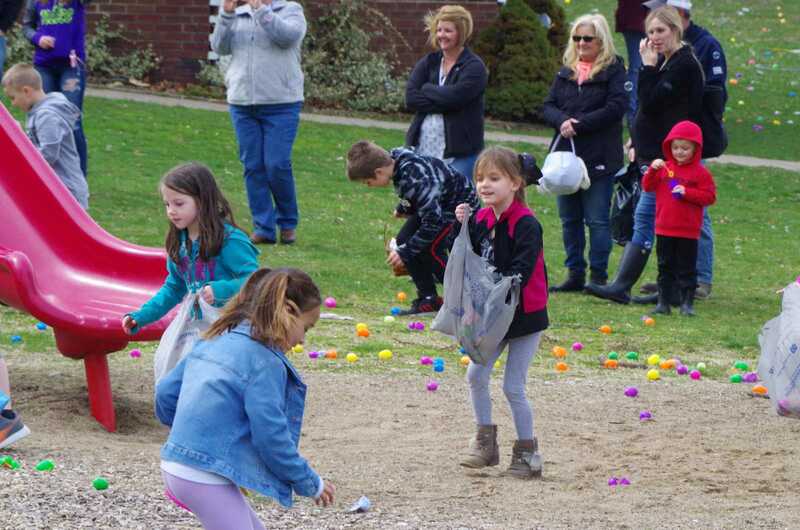 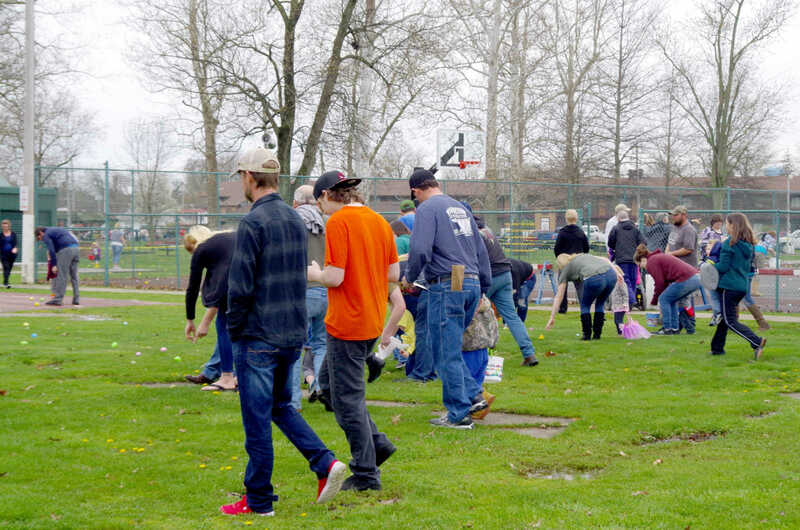 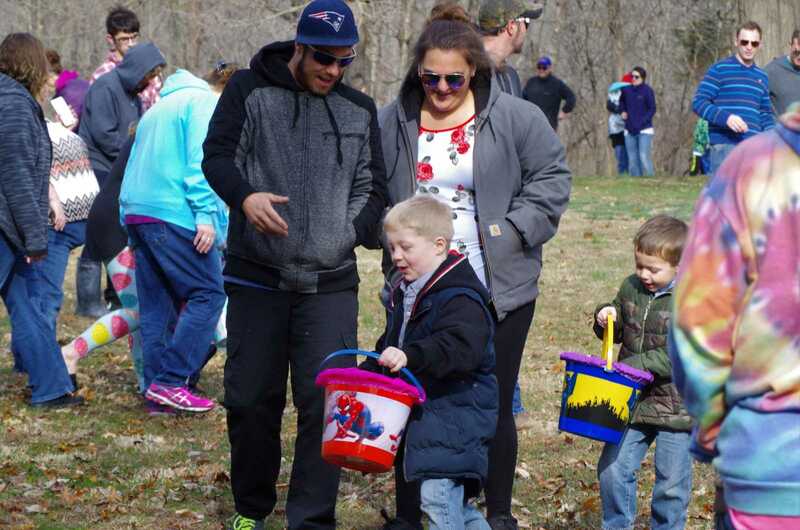 The 2018 Easter Egg Hunt at Shakamak State Park was one of those originally slated to take place Saturday, March 24, but instead began at 10 a.m. Saturday morning near the swimming pool area. 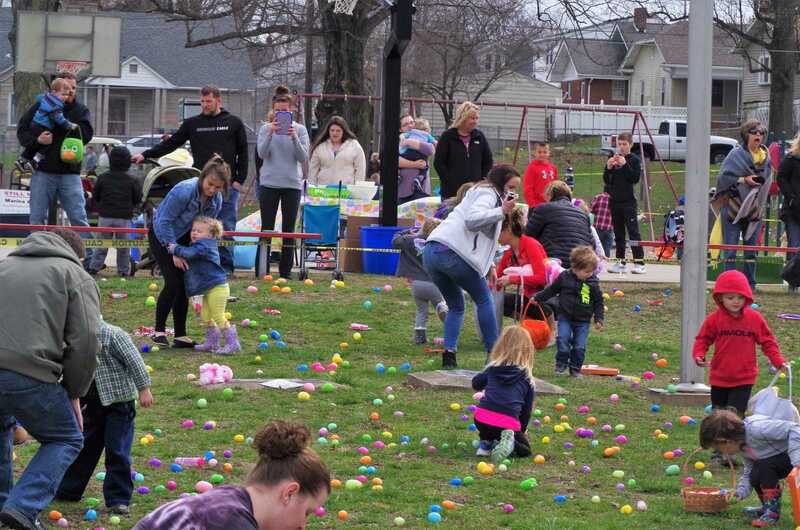 The packed event seemed to be over in a flash, but after the nearly 2,000 eggs had been picked up, families gathered by the shelter house for a prize drawing of several bicycles and baskets for different age groups. 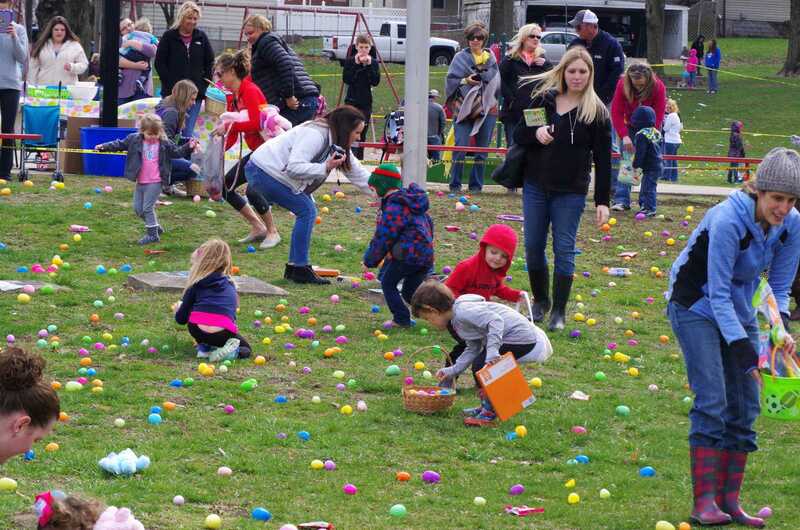 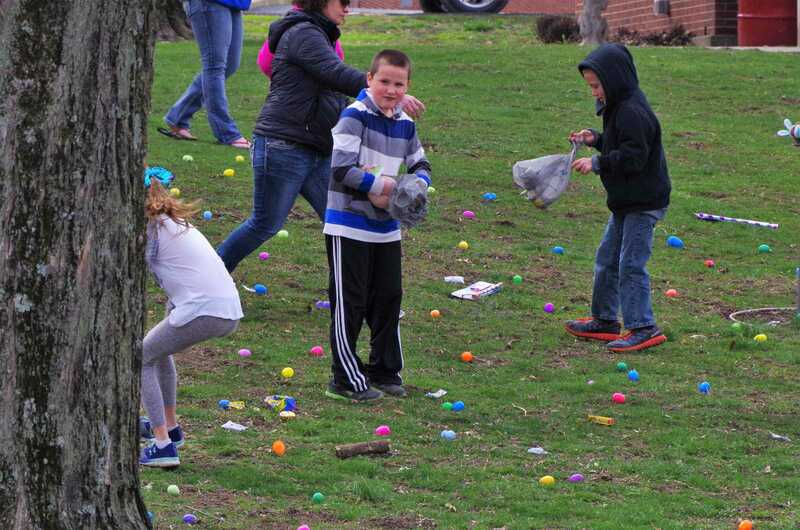 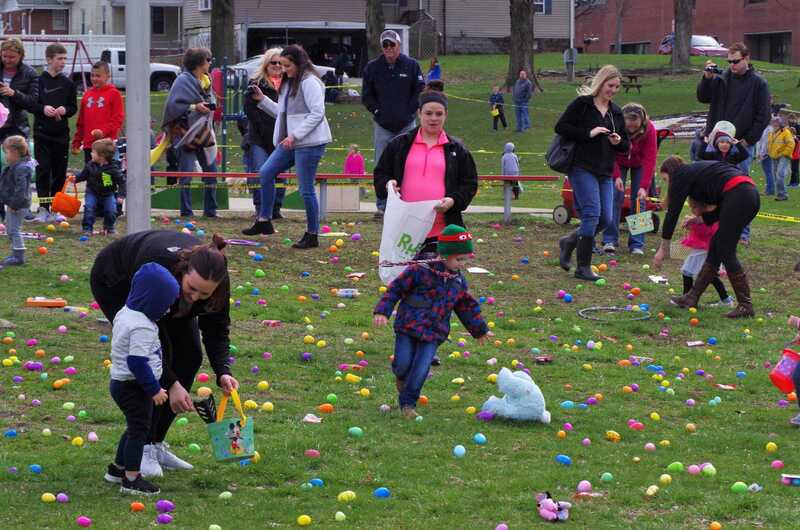 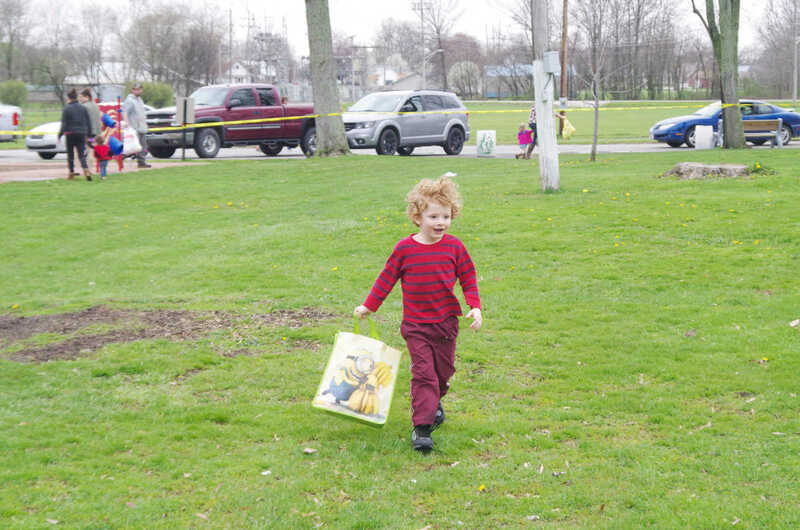 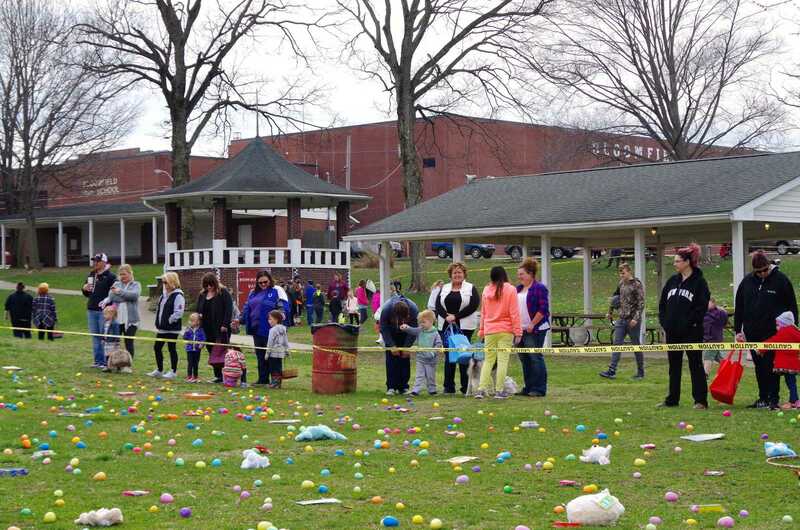 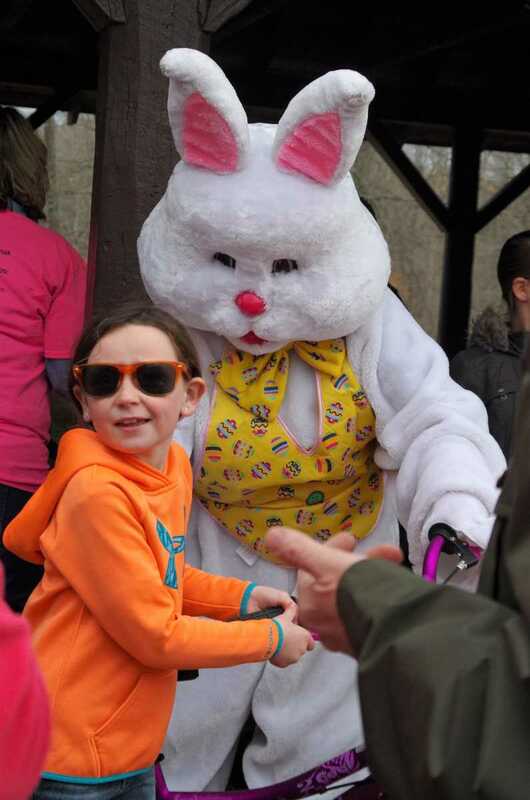 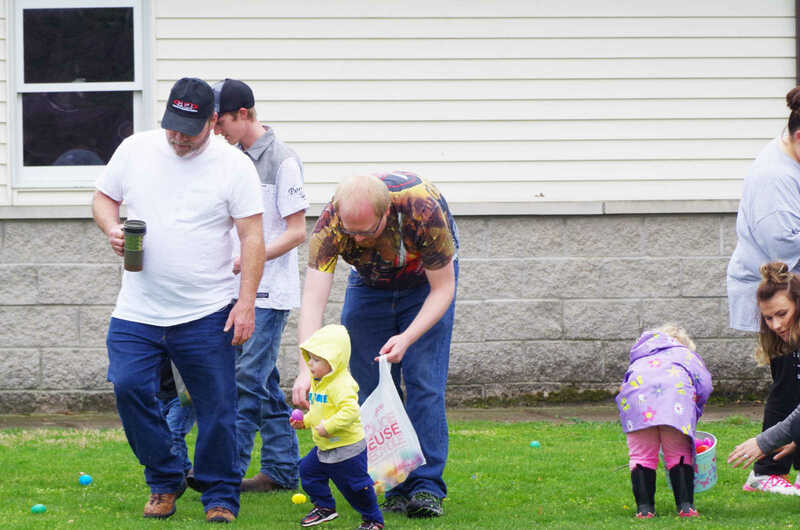 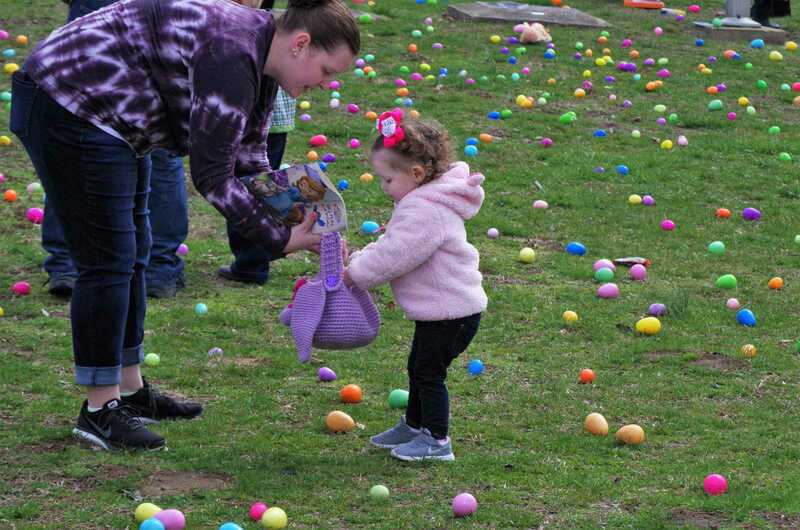 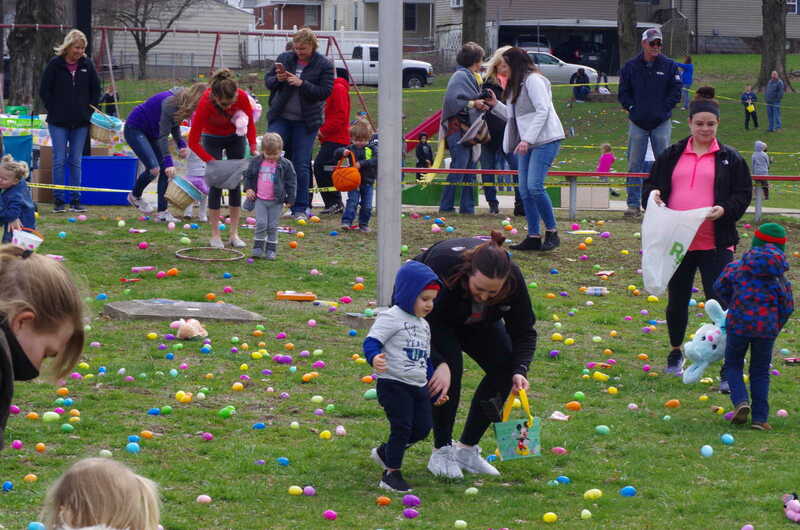 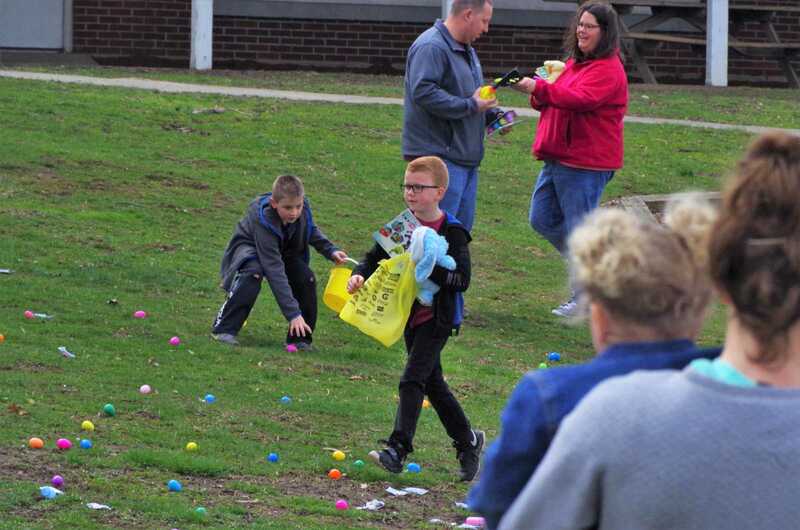 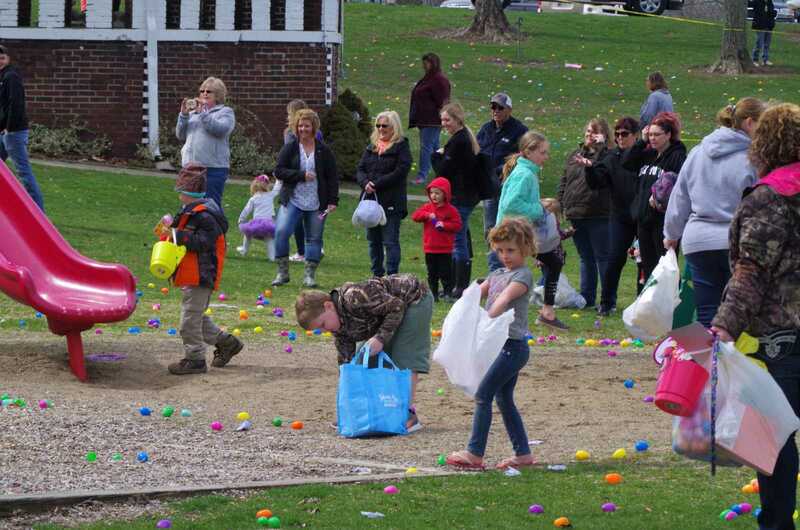 The 2018 Easter Egg Hunt in Bloomfield began around noon. 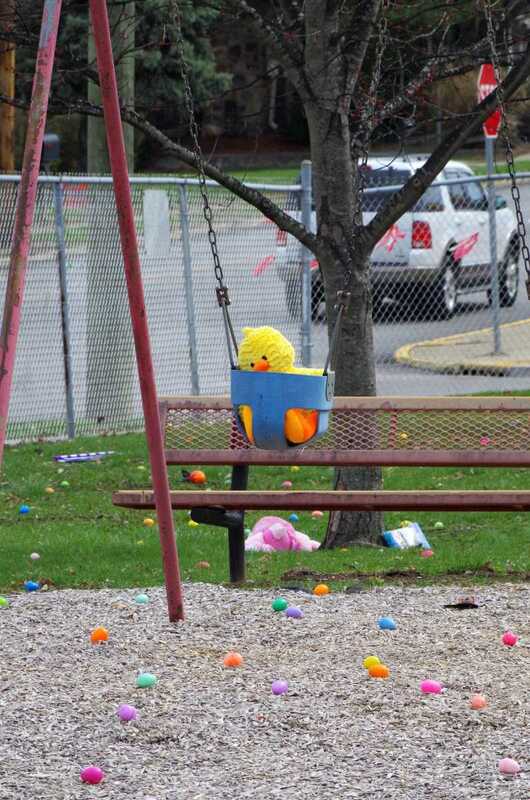 Families waited at their age-designated areas, which were sectioned off by yellow tape. 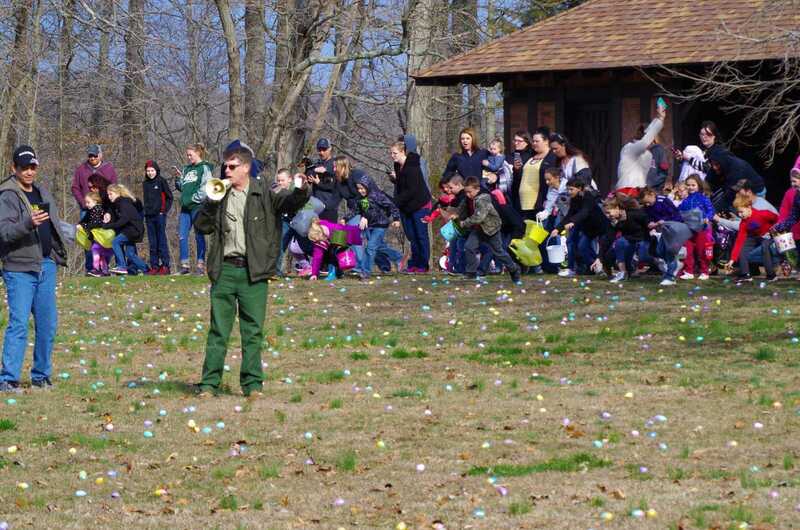 The Easter Bunny was available to entertain hunters while they waited their turn. 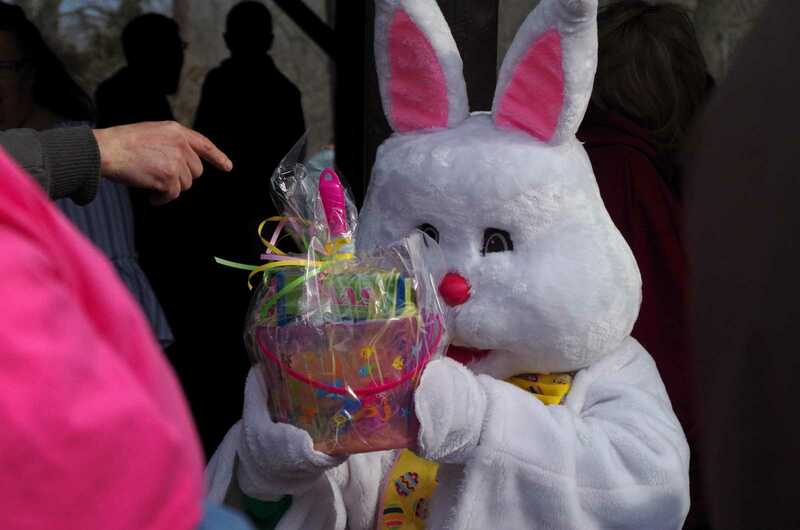 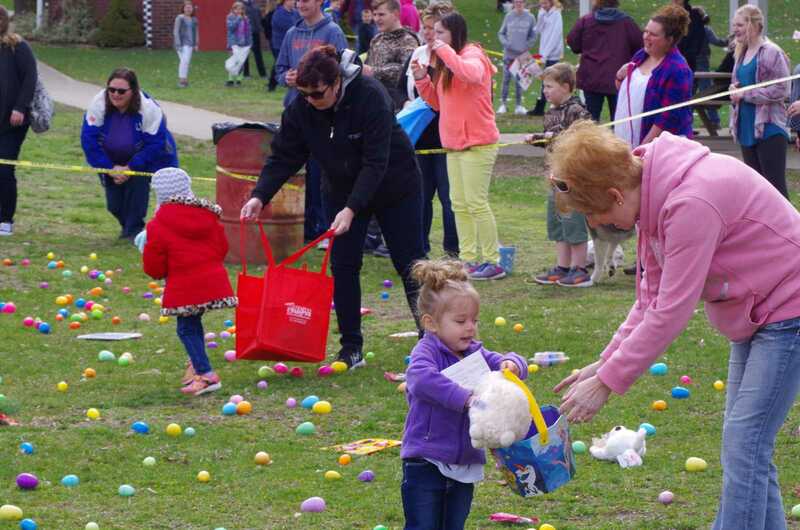 Unlike at Shakamak, the prizes—-mostly books and stuffed animals--were distributed among the eggs. 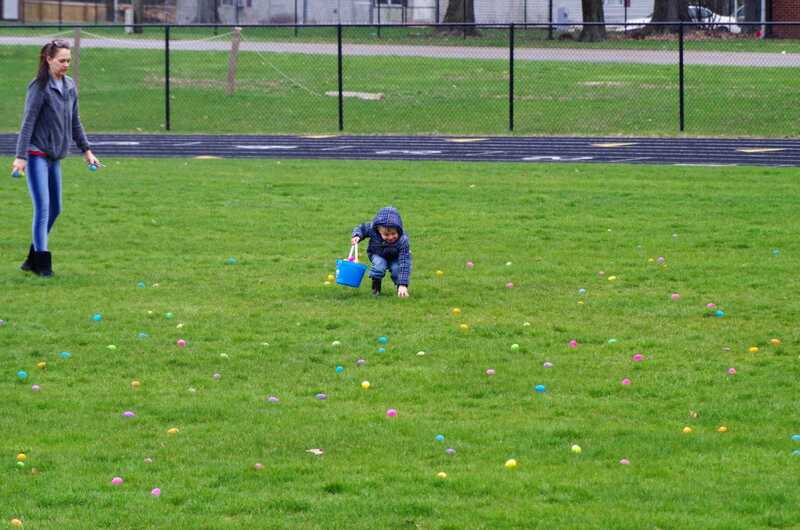 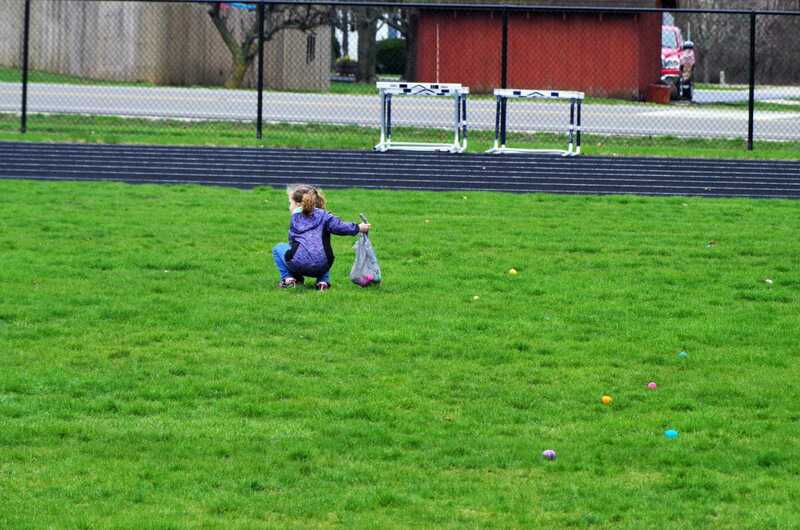 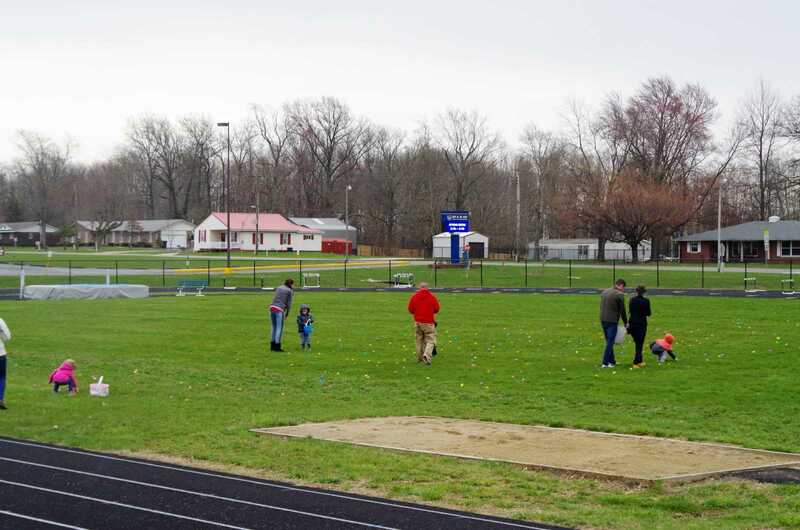 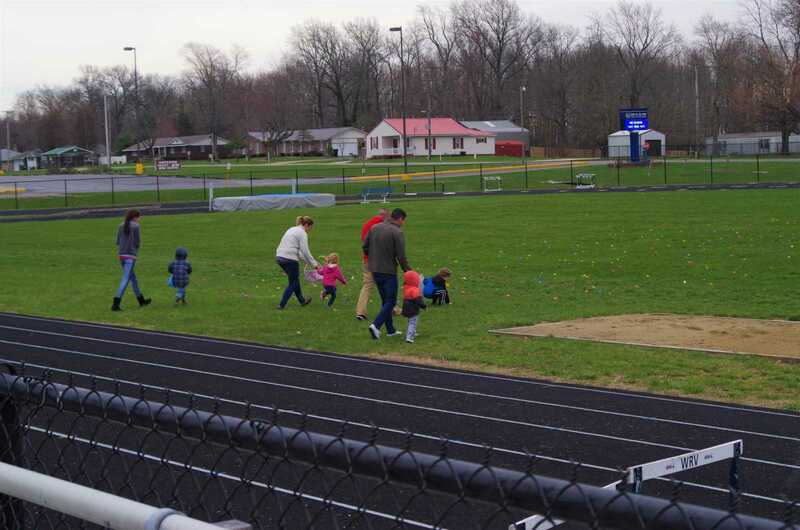 Two hours later, in Switz City, another Easter Egg hunt was held on the high school track at White River Valley Jr/Sr High School. 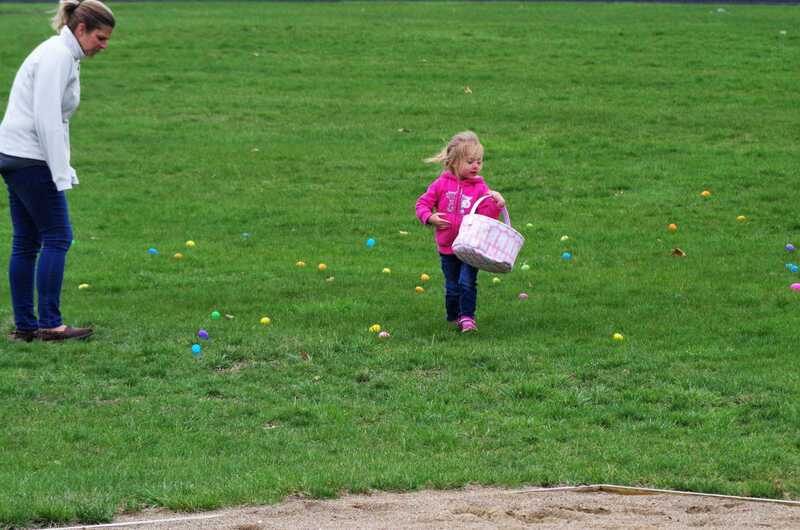 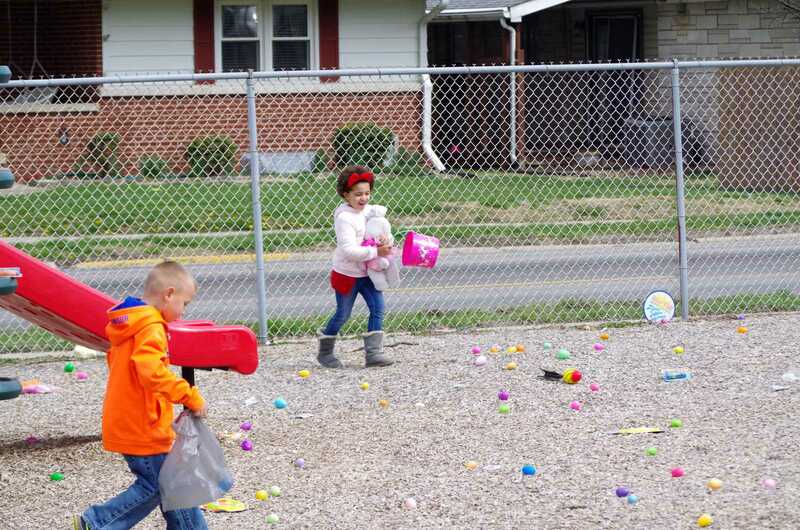 The Easter Egg hunt was put on by the WRV FCCLA. 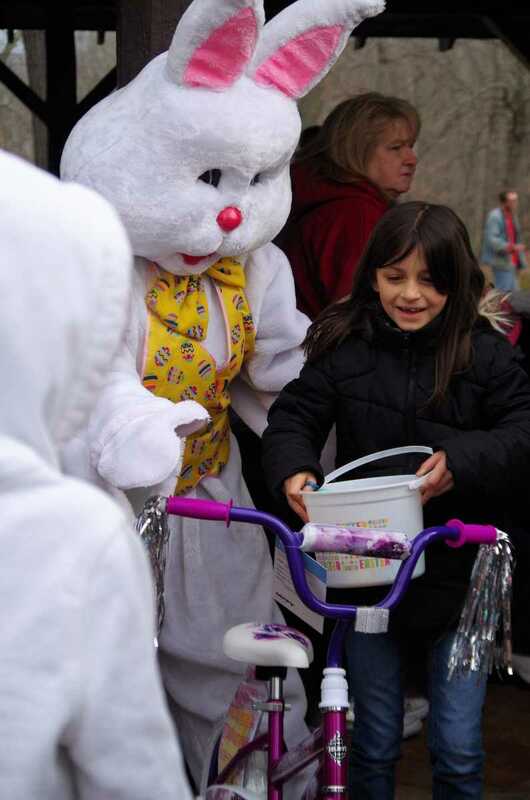 Just prior to its beginning at 2 p.m., rain started to fall, but children were more than happy to brave the rain to fill their buckets. 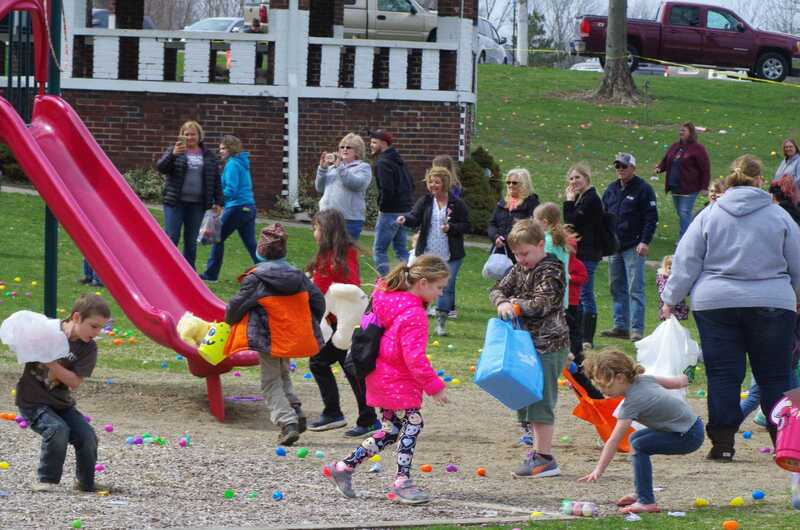 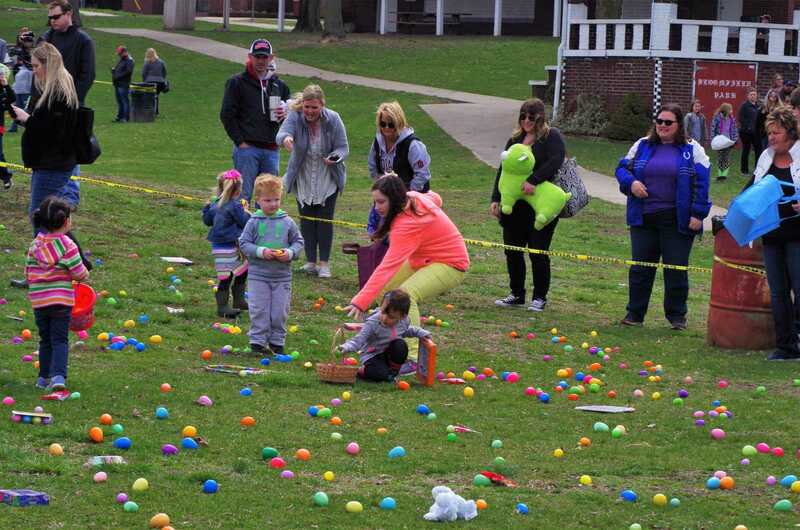 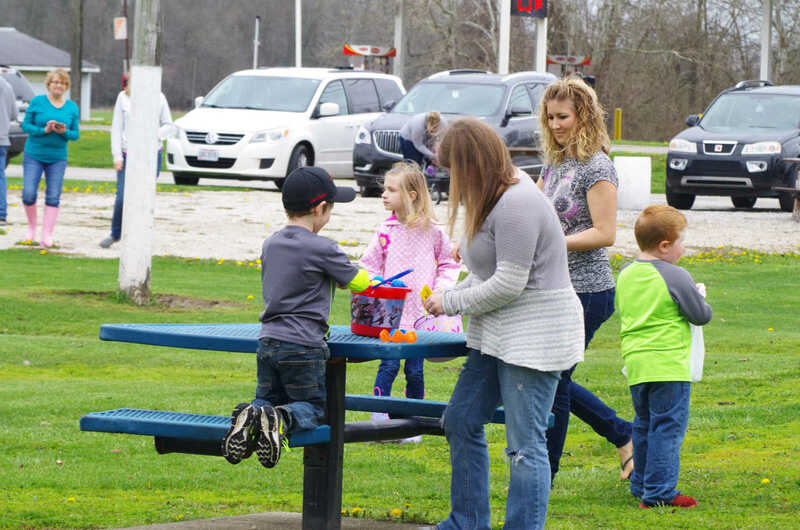 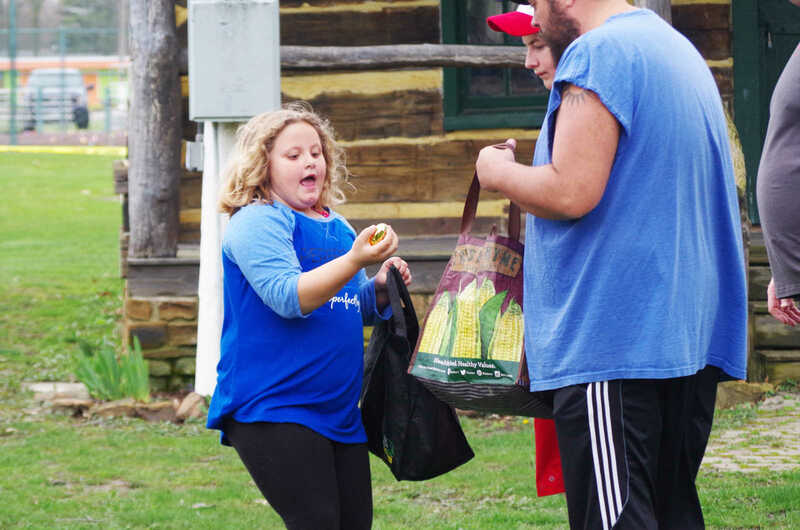 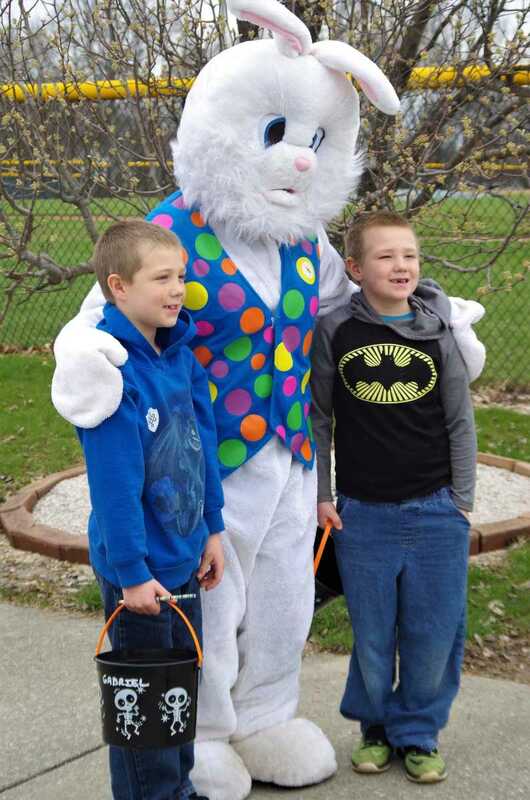 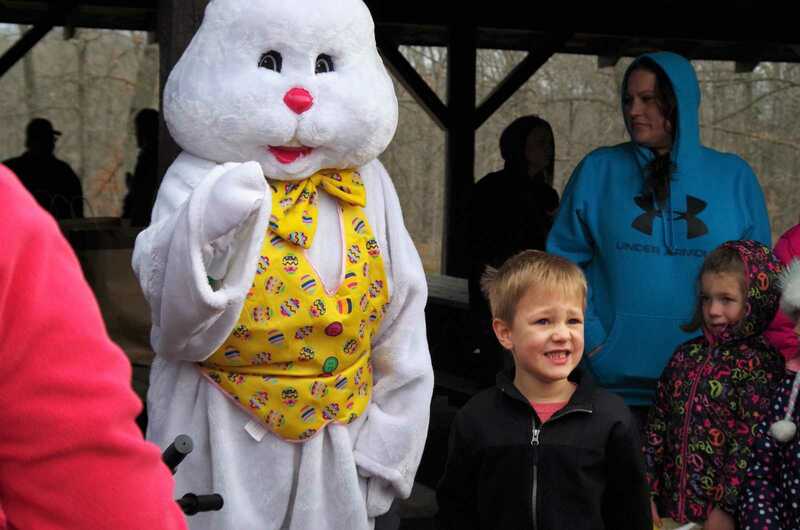 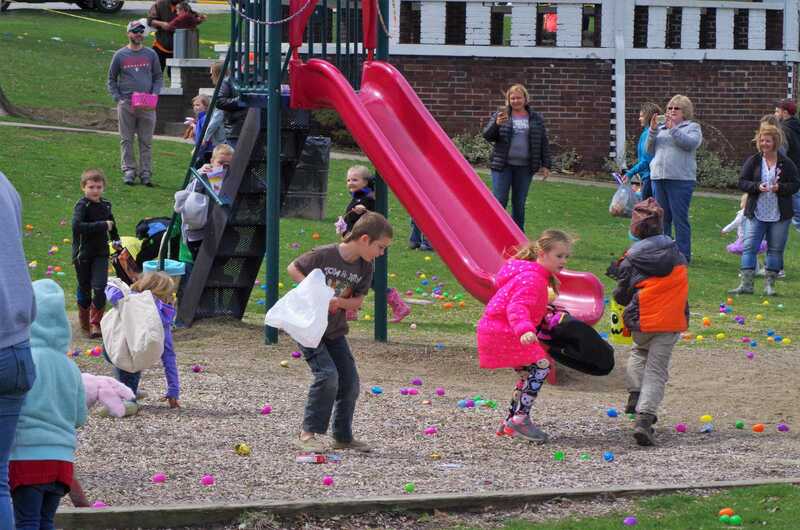 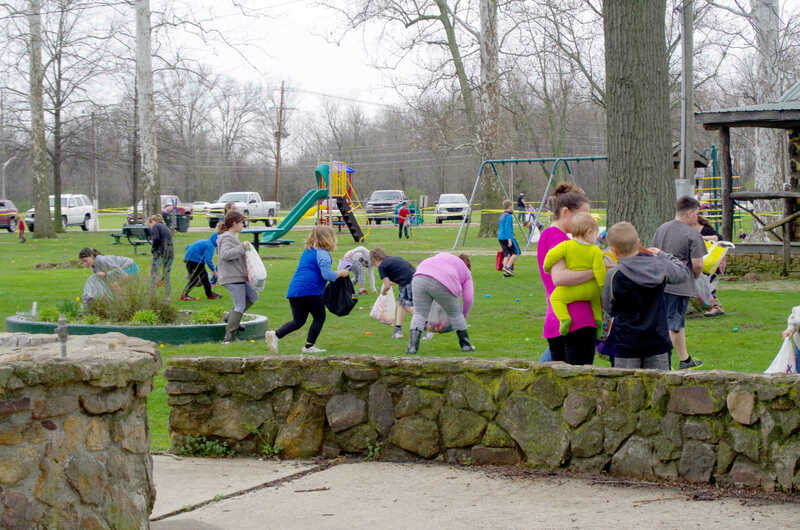 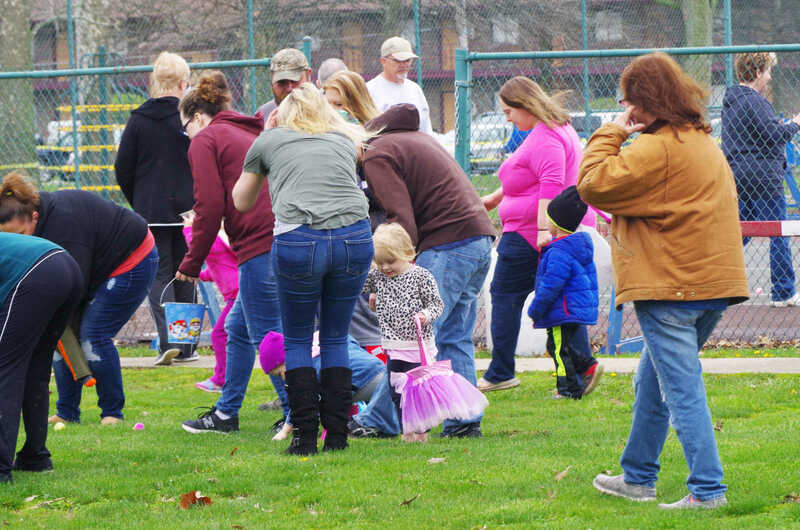 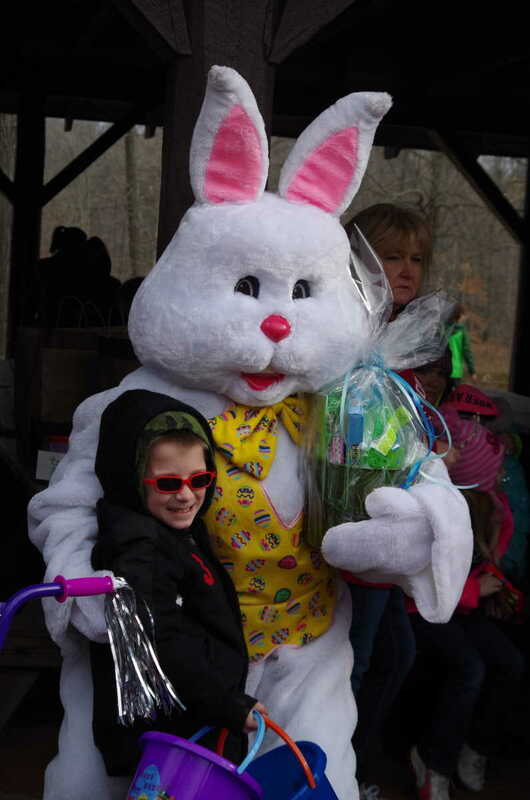 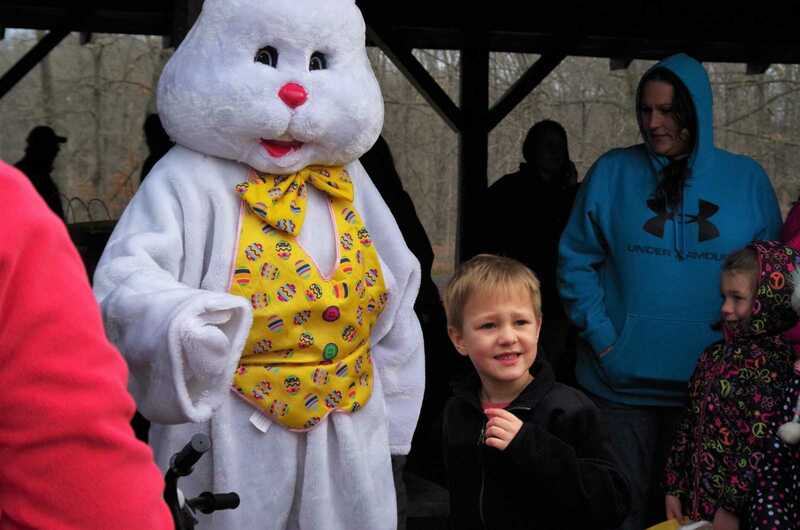 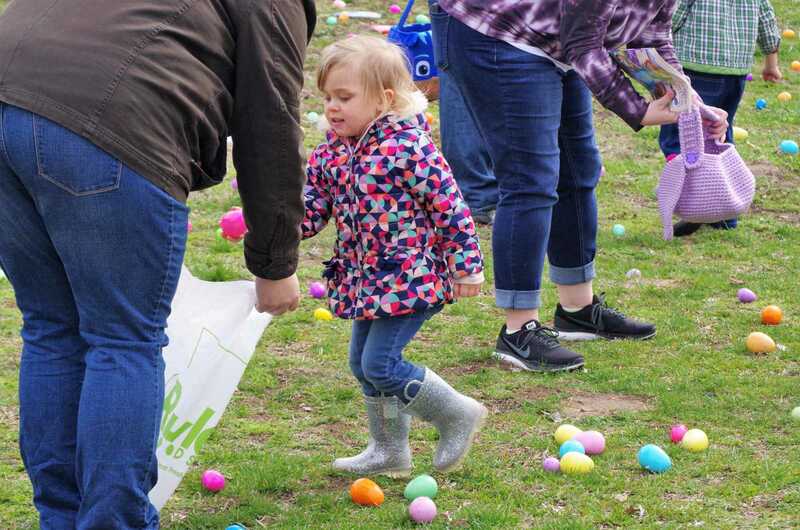 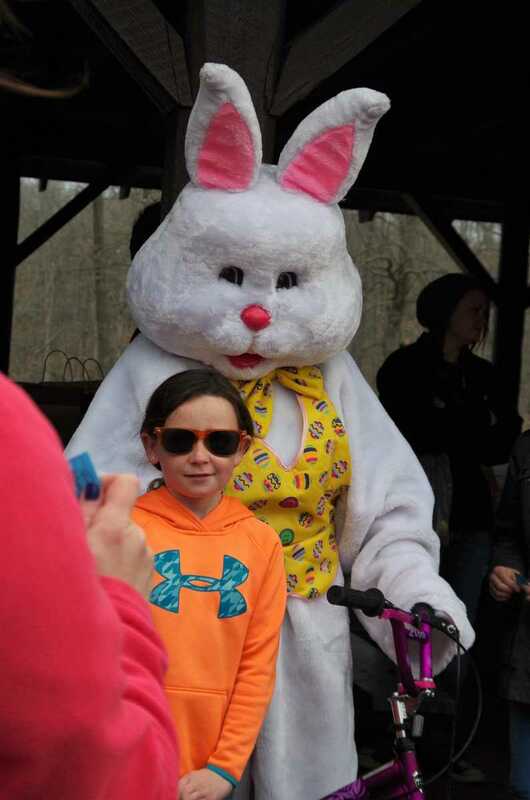 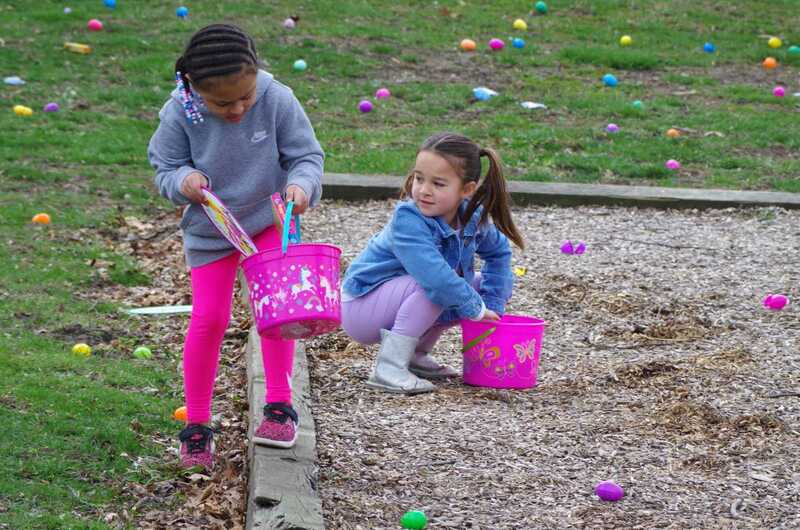 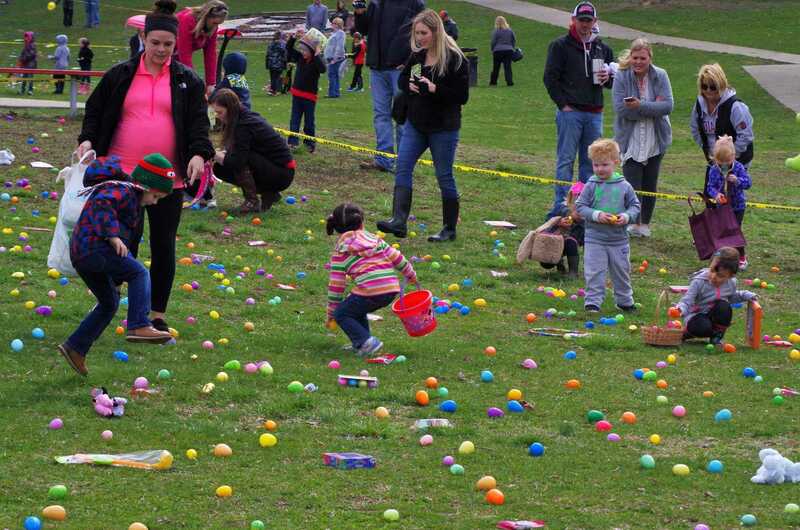 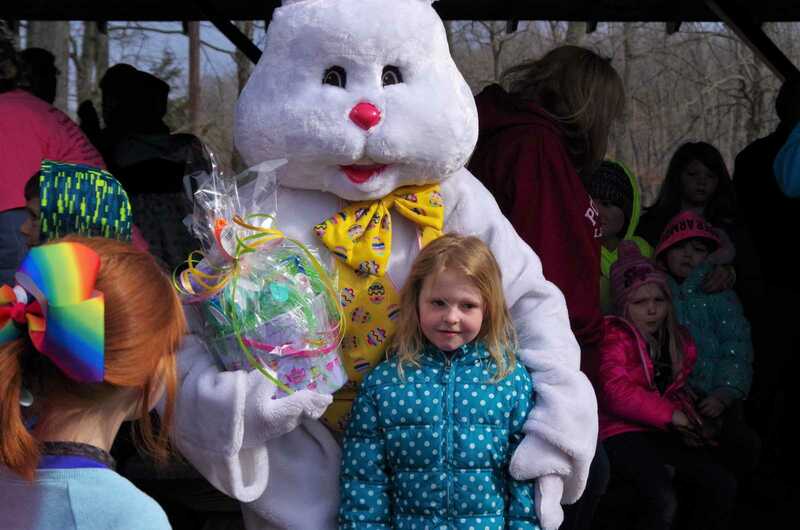 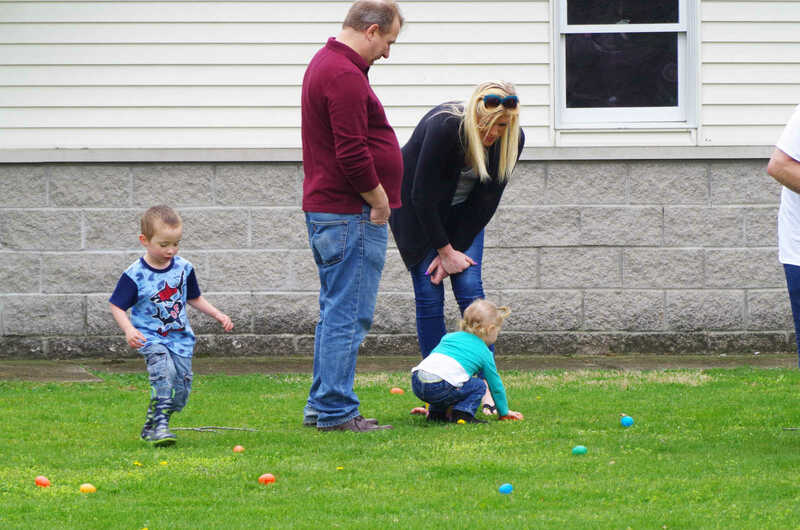 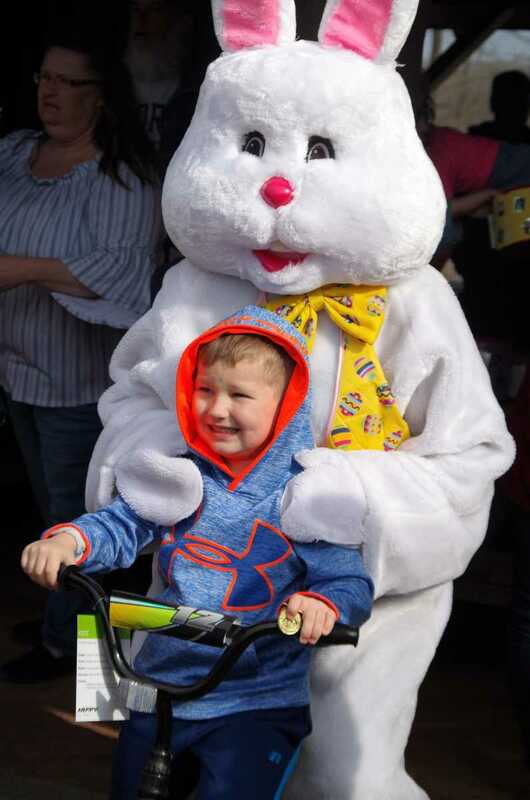 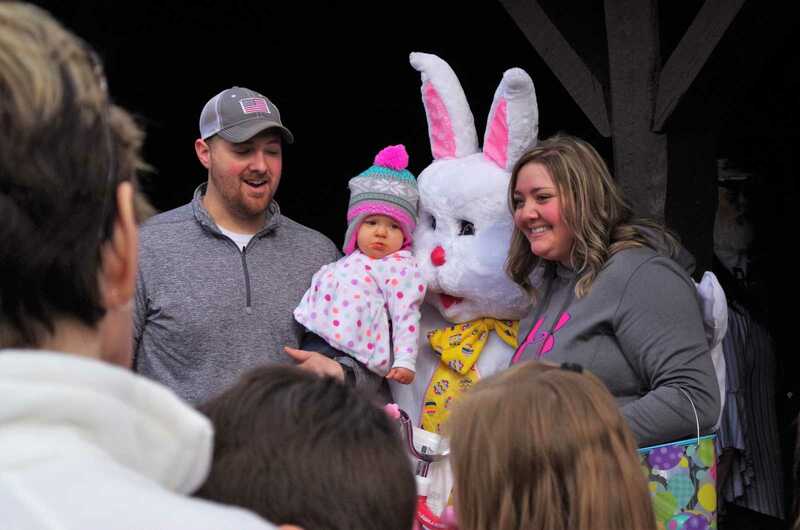 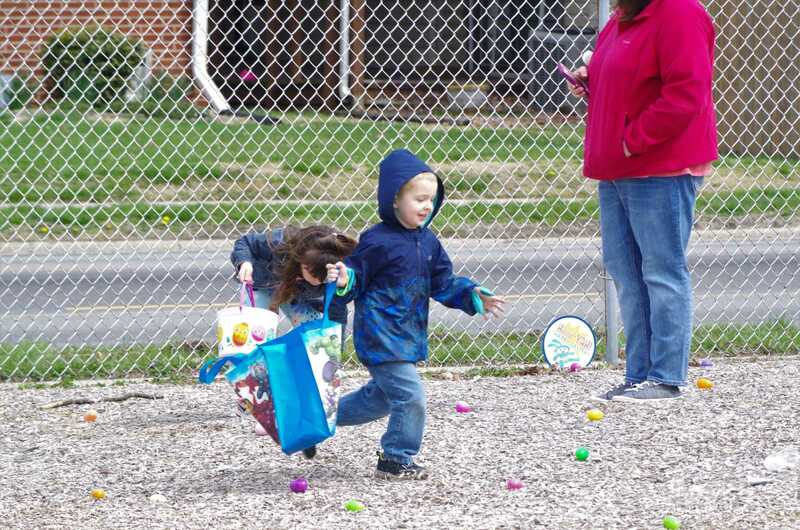 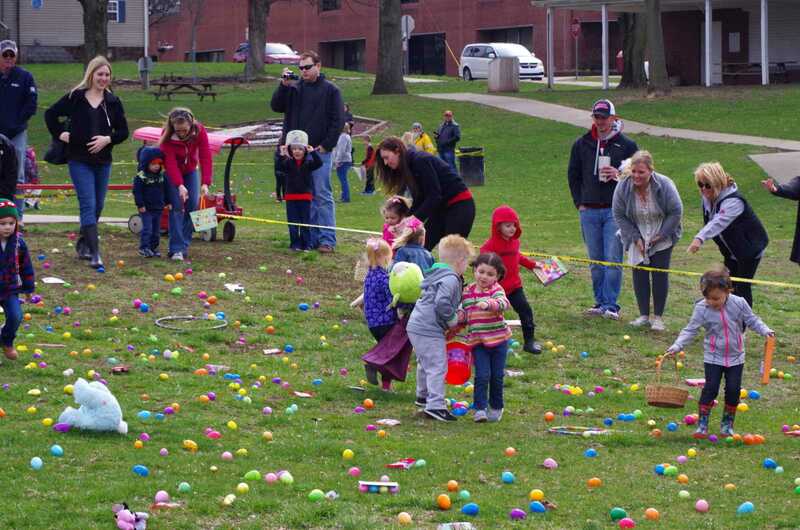 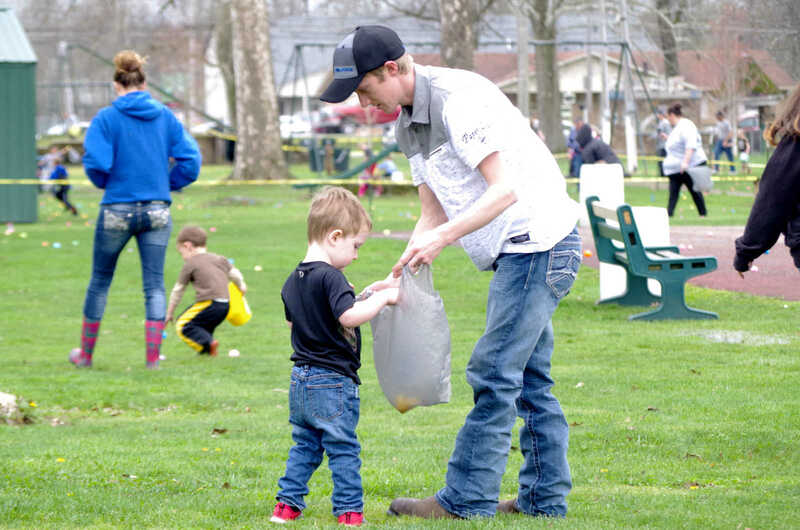 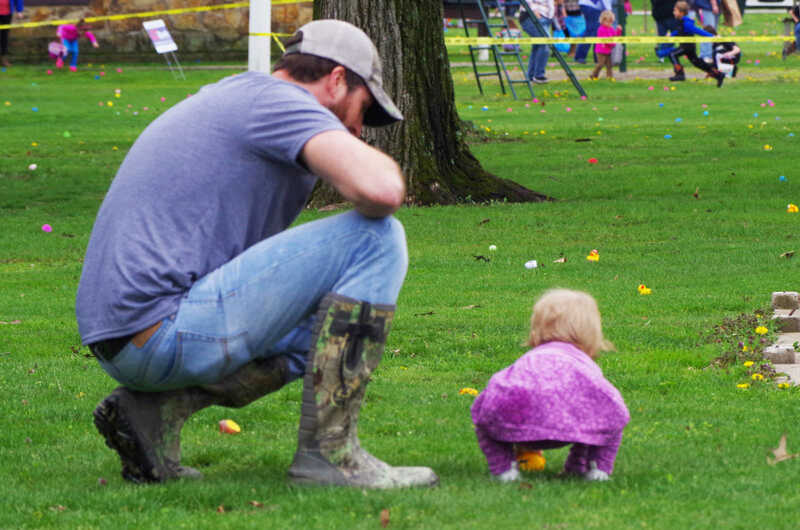 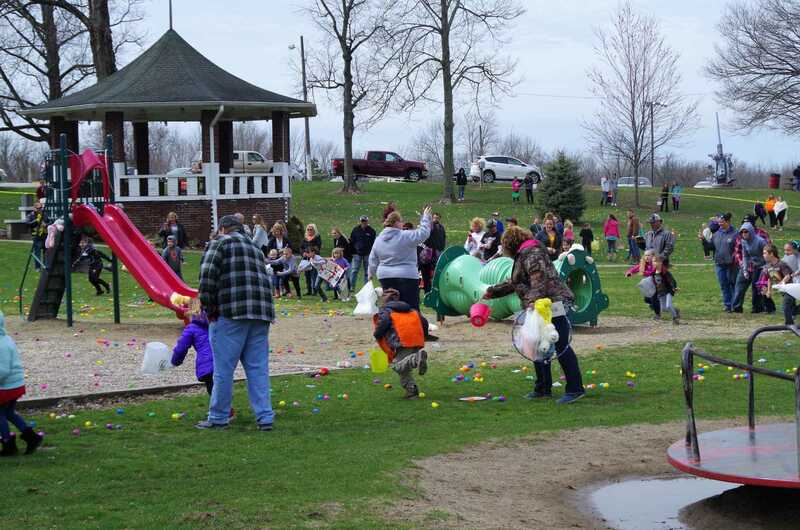 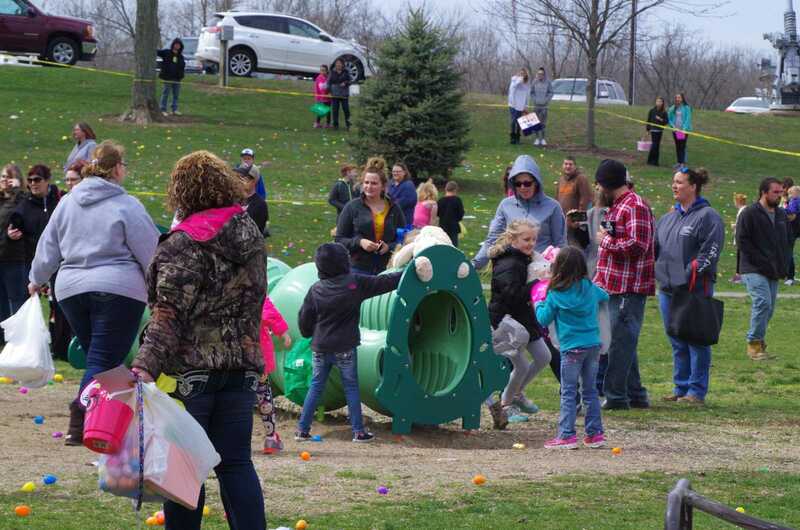 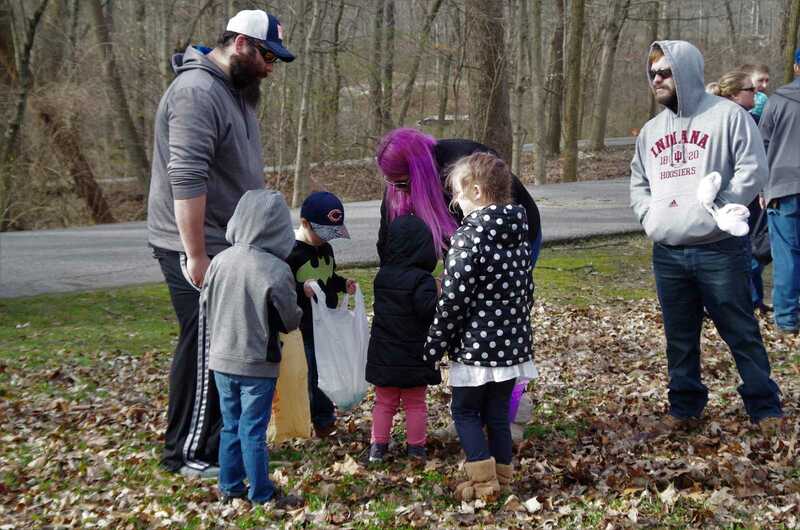 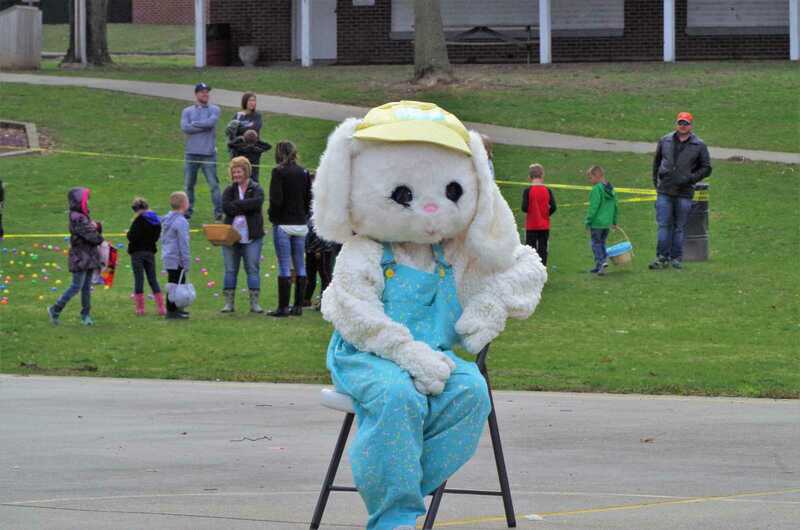 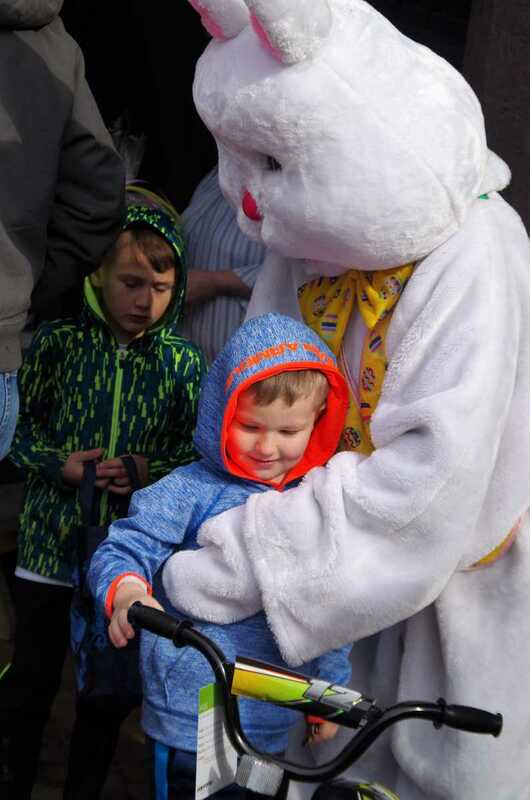 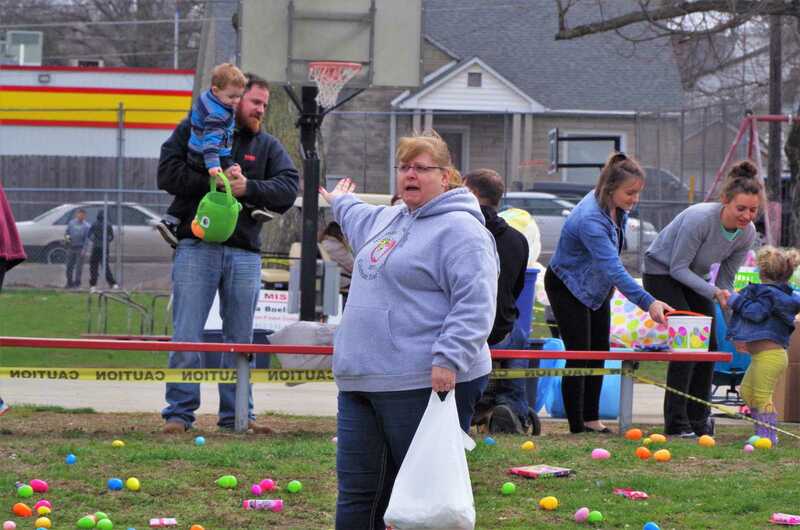 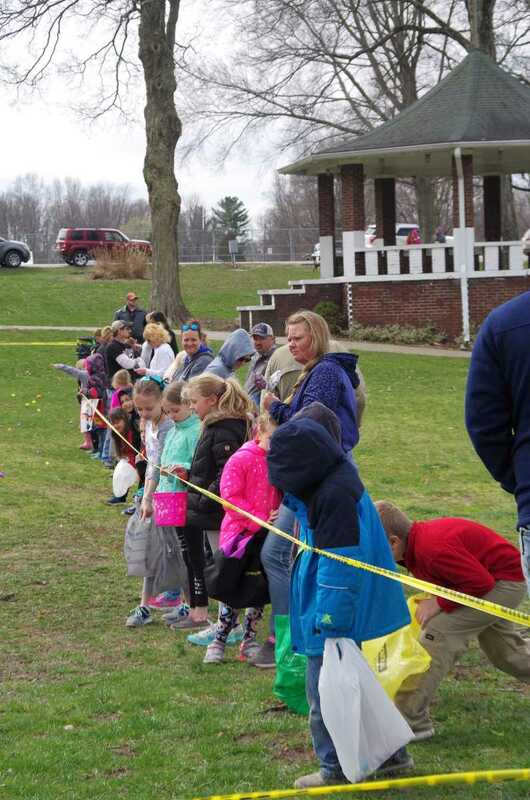 The 2018 Easter Egg Hunt at Linton's Humphreys Park, hosted by Owen County State Bank and joined by Pride in the Park, was finally held Saturday, April 14 at 2 p.m. 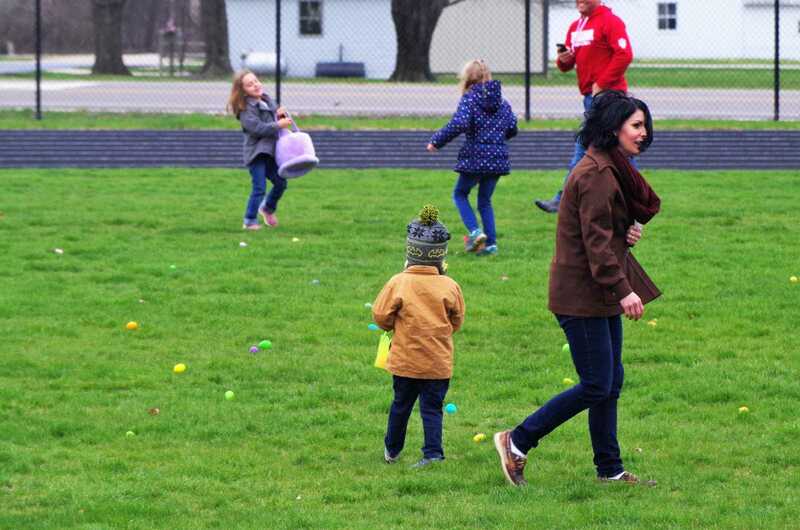 The delay by no means discouraged children, including one kiddo who ducked under the yellow tape and charged the field before the airhorn sounded and was quickly gathered by a male relative.